One of the major signs of healthy hair is the fabulous sheen it reflects under light. Shiny hair is a sign of smooth cuticles and moisturized strands. So how do you make sure your hair shows off all the hard work you put into it? Let’s go over some tips and techniques. Cool it down.- A quick rinse of cool water at the end of your wash routine will encourage your hair’s cuticles to close, creating smooth hair strands that shine. A blast of cool air after your blow out will work the same way. 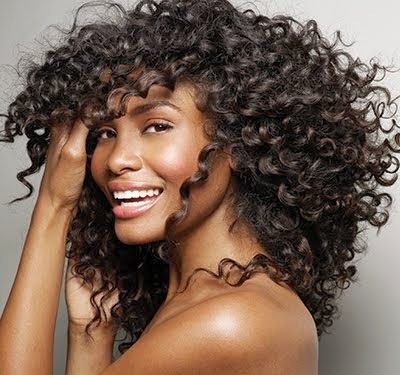 Don’t forget to deep condition.- Dry strands are dull strands. A deep conditioning or hot oil treatment once a week will infuse the kind of moisture that your hair needs to maintain bounce and shine. For an example of a conditioning routine, click here. Stay hydrated.- You get out what you put in, so stay hydrated and your hair will grow accordingly. Easy as ACV.- Apple Cider Vinegar is useful for a great many things. Diluted with water, it’s a great rinse to remove product buildup and close your cuticles. Choose great products.- There are several serums, sheens, and other products that can add shine to your finished style. Strive for alcohol-free products like this one and this one. One important thing to remember is that style and texture are also huge factors in how your hair reflects light. Straight hair is all laying in a uniform direction and therefore creates the ideal surface for max shine. As hair gets curlier or kinkier, light gets reflected in multiple directions and doesn’t create the same sheen. These hair types can still shine, but it will take a little more effort. Don’t forget, if you’re having trouble making it work, visit your friendly neighborhood All Dolled Up and let the professionals give you styling advice customized to your unique strands. ← ADU Client Corner: Kendra R. Sylvester, M.D.